A year ago, a Philly cop fatally shot a fleeing man from behind. The cop was fired. Will charges be filed? 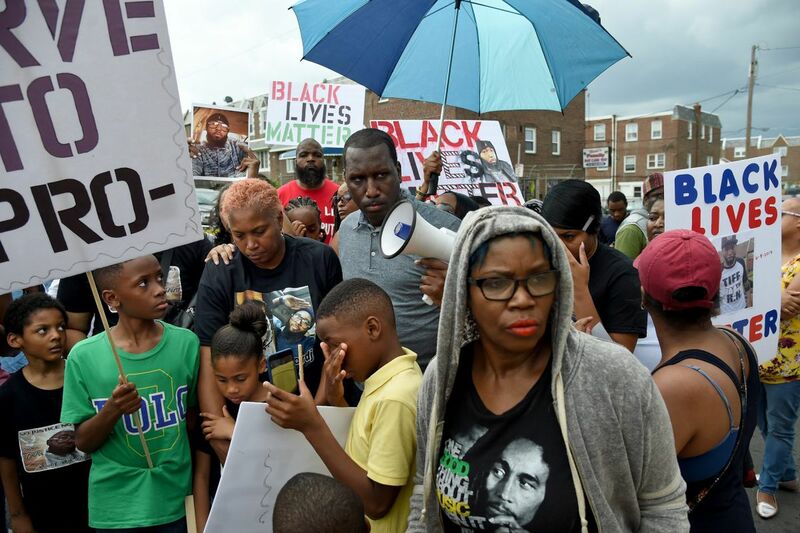 Doretha Crosby (center, left) the mother of David Jones, joins friends and family in a protest outside headquarters of the 15th Police District on June 19, 2017. Jones was fatally shot June 8, 2017, by Philadelphia Police Officer Ryan Pownall, a 12-year veteran assigned to the 15th District. With bullhorn is Asa Khalif with Black Lives Matter Pennsylvania. Friday will mark a year since the violent North Philadelphia street-corner confrontation between Philadelphia Police Officer Ryan Pownall and dirt-bike rider David Jones, 30, which ended when Jones dropped a gun and ran with his hands in the air, and Pownall fatally shot him in the back. The killing, captured on a nearby store's surveillance video, sent a jolt through the city, much like the national outcry over the similar 2015 fatal shooting of Walter Scott by South Carolina police officer Michael Slager. But although Slager was quickly arrested after cellphone video surfaced of him shooting Scott in the back as he ran off, no decision has been made about whether Pownall will be charged. David Jones (left) who was fatally shot in the back by Officer Ryan Pownall, with Tiffanie D. Luke and her son T’Khai. And while Slager is serving a 20-year prison sentence, Jones' relatives and their supporters are wondering whether Pownall, a 12-year veteran who was fired in September — and who allegedly shot another man eight years ago — will face justice. "Truthfully, they're taking too long, like they're trying to stall," said Jones' father, Thomas. "I know they got a lot of cases and things take time, it's not an overnight process. I respect everything they're doing, but I still don't feel good about the whole thing. We haven't gotten justice. I'm still hurting, I'm still grieving." The last time an on-duty Philadelphia police officer was charged with a fatal shooting was in 1999. Thomas Jones and others who want Pownall charged are focusing their attention on District Attorney Larry Krasner, who took office in January pledging to change the city's traditional approach by arresting officers in fatal shootings if the evidence supports it. District Attorney Larry Krasner with Sen. Bernie Sanders at a criminal justice forum in Philadelphia last month. "If we have facts and we have the law, if we follow the evidence instead of following anybody's politics, and we have a case in Philadelphia County, we are bringing a case in Philadelphia County," Krasner said during a January forum at the Central Library of the Free Library that drew an audience heavy with lawyers, judges, and community activists. Thomas Jones is growing impatient, though. "I just hope that he keeps to his word and does what he said he's going to do," he said of Krasner. "I'm just holding tight, and we will wait for the outcome." Others are deeply troubled by the length of the investigation. "This is murder; it don't get no clearer than this," said Robertus Duncan, a community activist for criminal justice reform. "There's a policy in place by the Police Department: If a man is not a threat to you, you're not supposed to shoot him. How is he a threat to him with his back to him and his hands up?" Demonstrators in 2017 protest the shooting death of David Jones. They were in front of the home of Police Officer Ryan Pownall. "I may not be a rocket scientist, but when you see a man run and get shot in the back by an officer with a history of shooting people, what is taking so long?" asked Asa Khalif, a local Black Lives Matter leader. Philadelphia Police Commissioner Richard Ross, in announcing his intention to fire Pownall in September, said the officer had committed a host of departmental violations and displayed "poor judgment" when he shot Jones in the 4200 block of Whitaker Avenue in North Philadelphia. Jones had been riding a dirt bike, which is illegal, and had an illegal gun when Pownall pulled him over. It was not the first time Pownall had allegedly shot someone in the back. In 2010, Carnell Williams-Carney was paralyzed when he was shot in the back while running from police in Frankford. In Williams-Carney's 2013 federal lawsuit against the city, Pownall testified that he believed he was the shooter. But it is impossible to determine with certainty because the bullet is lodged in Williams-Carney's body, and the jury ruled in Pownall's favor. John McNesby, president of Fraternal Order of Police Lodge 5, said that Pownall's actions in Jones' shooting were justified under the circumstances and that the union is "looking forward" to helping him get his job back through arbitration. "When you're out on the street — the man had a loaded gun, there was a struggle — things happen," McNesby said when asked about Jones' having been shot in the back. Ben Waxman, spokesman for the District Attorney's Office, emphasized that although the shooting happened a year ago, Krasner has had the case only since taking office in January. Previously the probe was being handled by the state Attorney General's Office due to a conflict of interest involving Krasner's predecessor, Kelley B. Hodge. Waxman declined to discuss the status of the case or to estimate when Krasner's investigation would be completed. The odds of officers being criminally charged for on-duty slayings are slim, studies show. Although the Washington Post found that police in the United States fatally shot 987 people in 2017; 963 in 2016, and 995 in 2015, just a tiny fraction of those officers will be arrested, said Philip Stinson, an associate professor of criminal justice at Bowling Green State University in Ohio. Data compiled by Stinson show that since 2005, just 85 non-federal officers — police, deputy sheriffs, state troopers, etc. — have been arrested for murder or manslaughter resulting from an on-duty shooting. Of those 85, 32 have been convicted, and the cases of 12 are pending. Cases against police officers are difficult to win, Stinson said, because a cop's version of events often is accepted as truth, and it can be difficult for prosecutors to get other police officers who have witnessed shootings to cooperate. And laws allow police to use deadly force in certain circumstances, he said. Therefore, charging officers is "a tough decision for prosecutors to decide and wrestle with," said Stinson, a former Philadelphia defense attorney and former New Hampshire police officer. "When you get to trial, no matter what the prosecutor does — putting experts on the stand, putting other officers on the stand — as soon as the defendant officer gets on the stand and says, 'I feared for my life,' all bets are off, and they are not convicted." David Jones' survivors hope Krasner will conclude that Pownall should be the next officer to face justice. The loss of Jones, 30, a truck driver who was the oldest of 11 siblings, was so crushing to his family that his dad, stepmom, and six youngest siblings left Philadelphia in early May to start over in a suburb of Atlanta. "My younger children couldn't stomach that they didn't feel safe walking to the store. They were afraid," Thomas Jones said. "It was kind of crazy, in a way. My wife was saying, 'Let's leave, there's nothing here. Philly killed your son.' I was like, 'I can make it work.' But she pushed the issue." Although they have moved away to a clean, green community where neighbors are friendly, Jones said, foremost on his mind and on the minds of his family members is the status of the investigation into his son's death. But they have heard nothing from the District Attorney's Office or the Police Department, Jones said. "I've got the same number, but no one has called me about anything," the father said. "That's a hurtful thing."